These days, sending big files to other people via email (or even yourself!) is becoming more and more common. Any video file, or those huge 12-15 megapixel photos of the kids’ soccer game, etc sometimes exceed the email attachment limits of your email provider. Most of the popular web-mail email services like Gmail, Yahoo!Mail, and AOL all have file size limits of 25 MB or so for attachments.Â This means that you may have to send multiple emails, each with the various files you want to send, or you may even be prevented from sending the file at all if it is a large file.Â Video files typically encounter problems when trying to send through email. So what can you do besides invoking snail mail? or waiting to hand over a CD or DVD the next time you see the other person? There are free services online that let you upload files, and then simply send a download link that are live for a limited period of time – many times just a week or less, giving the recipient enough time to retrieve the file before the file become unavailable.Â Although there are services which let you transfer files via peer-to-peer, so that you don’t have to upload and leave your file in the hands of someone else, most people will want to use web-based services which temporarily hold onto your file until the recipient grabs it at their own convenience. One of the services I’ve recently been using has an upper limit of 1 GB of file size, deletes the file after 5 days, allows up to 20 downloads of the file and is free. 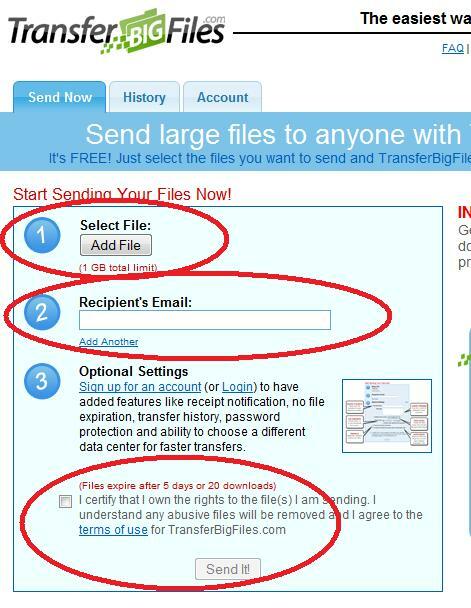 . . TransferBigFiles.com has a paid option which gives you more information like when people download the file, you can password protect the file, and some other neat features.Â But if you’re looking to pass files back and forth between co-worker or friends and family, this is a good option to check out.Â Â One great feature to use with this is to create a quick zip file archive of several files into one .zip file so that you can transfer it using just one link. BONUS TIP: I sometimes need to move files between computers – laptop and desktop, work and home, etc.Â This is a great way to send yourself a big file without having to burn DVD’s or carry around a USB flash drive from one place to another.Â This is a great way to “back-up” important folders on multiple computers.Â No need to transfer files over the network – just send them to yourself. QUESTION: HAVE YOU EVER ENCOUNTERED THE LIMITATIONS OF EMAIL FILE ATTACHMENTS? YES OR NO? Another favorite option is File Apartment (http://www.fileapartment.com). Easy to use, up to 1 GB, no software to download or registration required, and free option. I work as a graphic designer as well as a software developer, so I often have to share large files with clients. Instead of using this site, I use http://www.filesavr.com which stores files forever and gives you up to 10 GBs per file! I also like http://www.filedropper.com, but it only gives you 5 GBs per file. The advantage to File Dropper is if the file is not being actively downloaded, it will delete. Neither have annoying ads or countdown timers like Rapidshare or anything. My mistake, both File Savr and File Dropper delete the files if they are not actively being downloaded. I’m not advertising for them in any way, just sharing useful information.